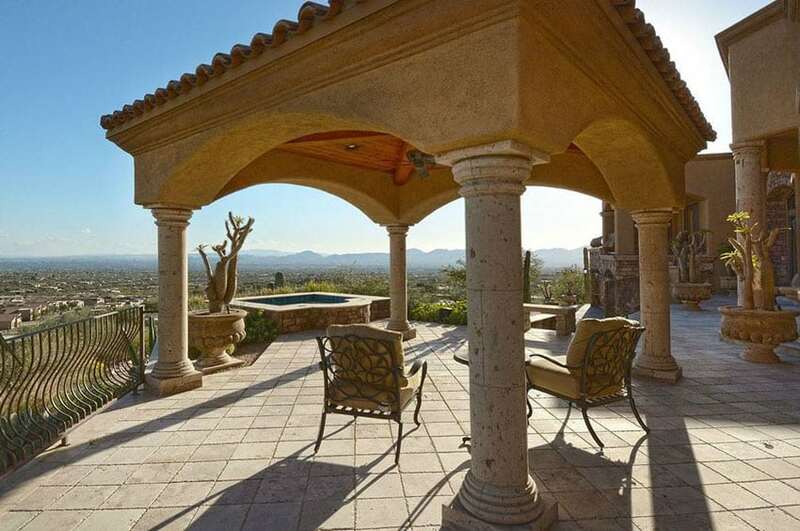 The gallery showcases pictures of gazebo ideas for creating the perfect backyard retreat. 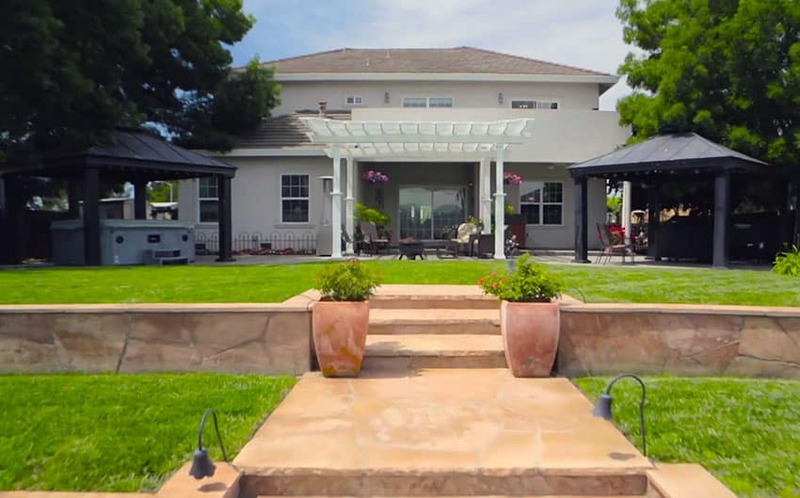 With a variety of styles including traditional octagon gazebo’s, modern covered porch styles, and contemporary gazebos above swimming pools, there’s plenty of ideas for design inspiration. Adding a gazebo to your home’s backyard is a great way to enhance its visual appeal and give your family and friends a beautiful environment for relaxing and conversation. The vinyl octagon gazebo shown in the image above is a sizable 12 feet in diameter. The shingle tiles and rooster weather vane mount has an early classical antique look that creates a homey and rustic charm perfect for this stone tile backyard and organic pool setting. 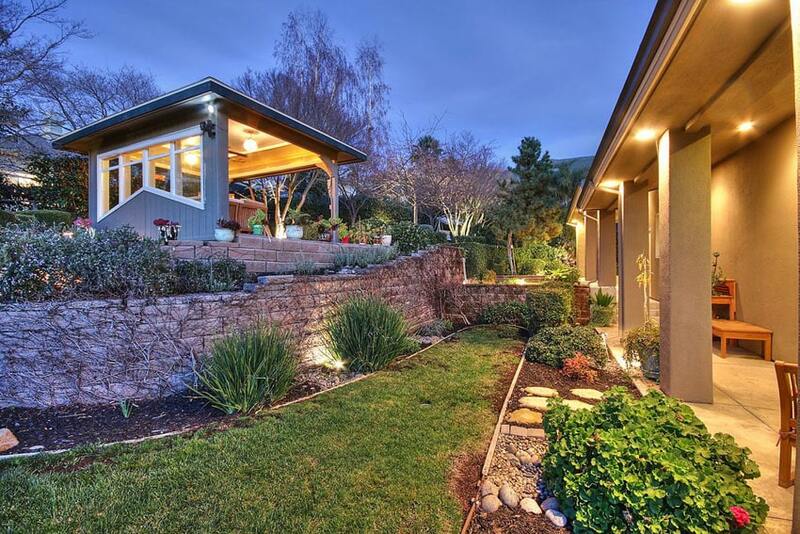 Set slightly above a swimming pool with a small wood bridge over a river rock feature, it makes an attractive focal point in this landscaped backyard. The laid stone pathways that traverse the green grass of this backyard leads to the large gazebo in this design. It serves as an outdoor lounge and houses quaint lounging outdoor furniture. Gazebos are perfect additions to your outdoors. It not only adds to the architectural aesthetics of your garden but also provides necessary seating area and shelter whenever required. 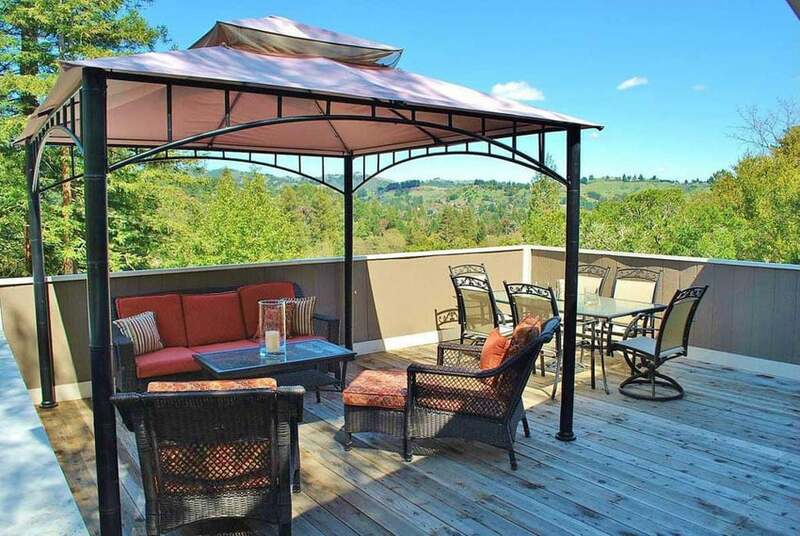 So if a weekend full of family get-togethers and outdoor parties with your friends is what you are planning, then a gazebo in your backyard is definitely helpful. Gazebos have been part of homes right from ancient times. Made of a variety of elements like wood, metal, steel and vinyl, Gazebos are constructed with much ease in modern times. They are built creatively in numerous designs that are inspired from architectural styles of countries around the world. From stand-alone gazebos to the ones attached to the main building, gazebos can be built in various ways depending on its use and space availability. 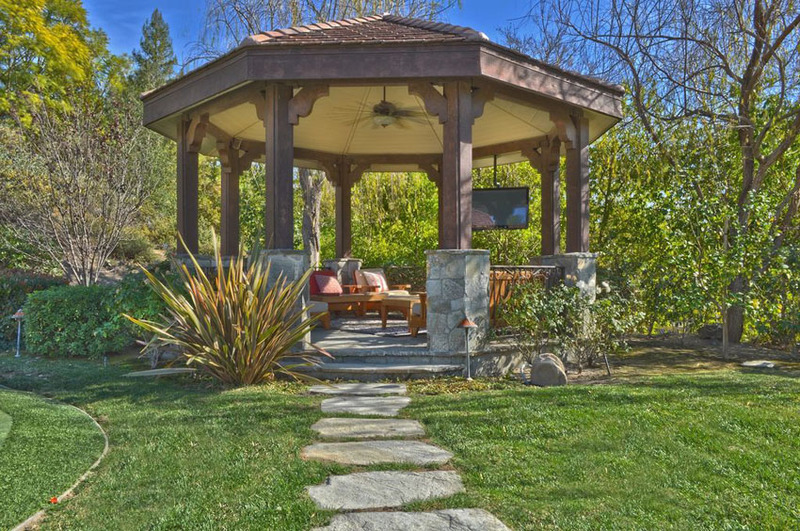 Here is a curated list of the most popular types of gazebo styles used in garden landscaping, each having its own functionality and decorative use. 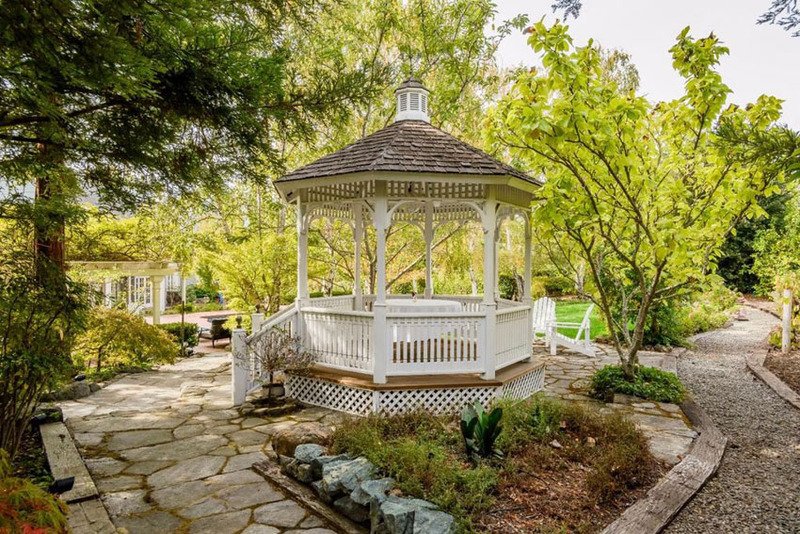 Victorian gazebos: Victorian gazebos carry a classic charm. What we usually visualize when we hear the word ‘gazebo’ is the Victorian style white gazebo made of wrought iron detailing, railings, finials and fretwork. A Victorian gazebo in your patio is a visual delight especially if you have lush greenery around. Victorian gazebos are popularly loved since they add the right bit of classic charm to the outdoors. Rustic gazebos: Rustic gazebos are usually made of old and recycled wood. The design of a Rustic gazebo looks very natural with unfinished wooden pillars and roof setting. They are made in a lot of shapes and sizes depending on its usage. Though not very concrete in looks like the other gazebos, Rustic wooden gazebos can be enhanced with lamps, plants and curtains to make it a perfect setting for your summer barbecue night with your loved ones. Oriental gazebos: Inspired by Asian structures, oriental gazebos add the right bit of zen appeal to your outdoors. Oriental gazebos could be simple and minimalistic with clean lines when its built in a contemporary style. The traditional oriental gazebos carry intricate woodwork and vibrant colors. Pergola gazebos: Pergolas are functional wooden gazebos that usually have a lattice roof. Pergolas have strong and simplistic pillars on which the roof, which is mostly open, is supported. 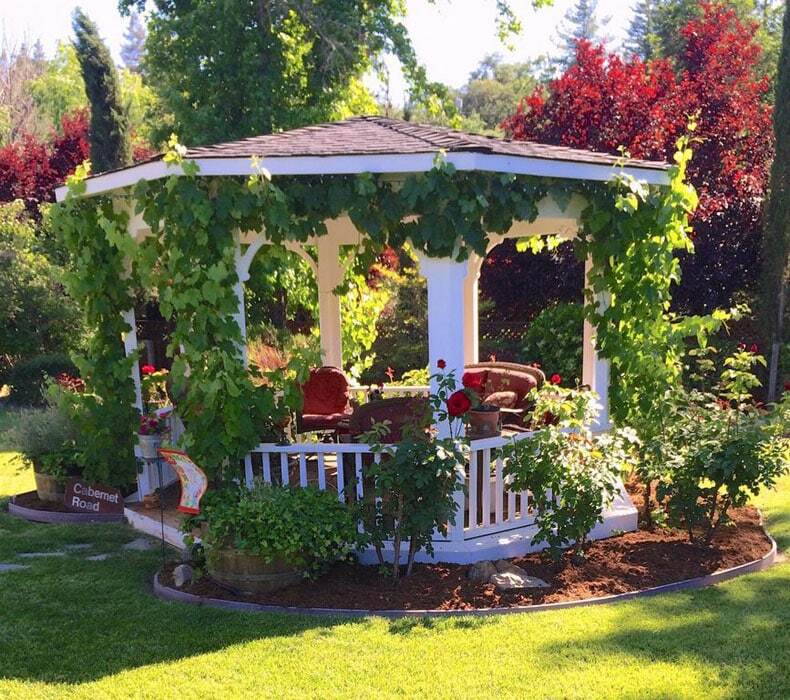 This type of gazebo is used to grow climbers and vines along the pillars, perfect for gardens and lawns that require a well-shaded seating area. Easy to build with minimalistic design elements, pergolas are sturdy and highly functional. Folly Gazebos: The prettiest among the lot, folly gazebos are purely ornamental. During ancient times, these types of gazebos were built on extravagant estates for decorative purposes. The most common type of folly gazebos are made of wrought iron and painted in white. With its adequate size and delicate looks, folly gazebos are surely beautiful addition to any outdoor area. Plant your flowerbeds in a folly gazebo or set up small benches to provide a seating area for kids and pets in your garden area. 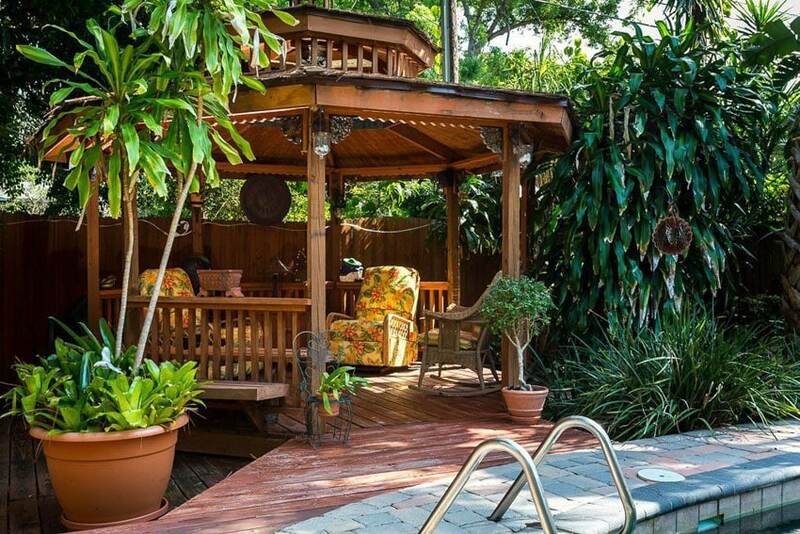 This tropical patio uses a very warm and undeniably cozy Cedar octagon gazebo that is an ample 12 feet in diameter. 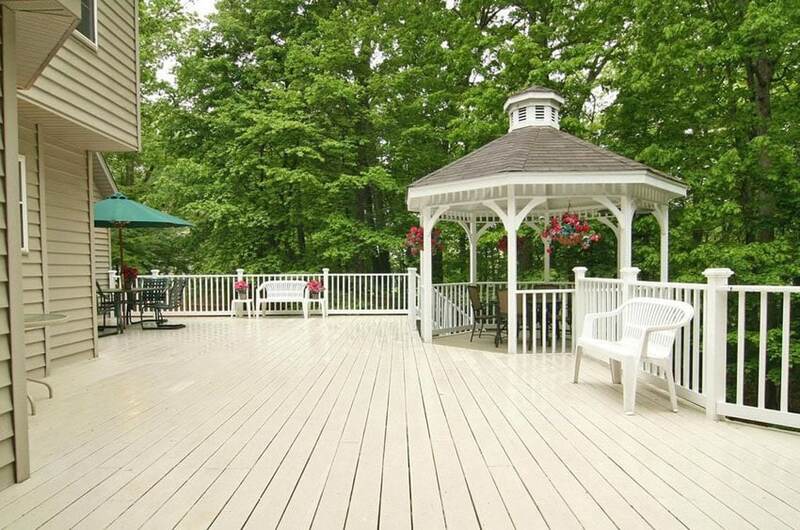 The wooden outside deck that this gazebo rests on leads to an outdoor pool. 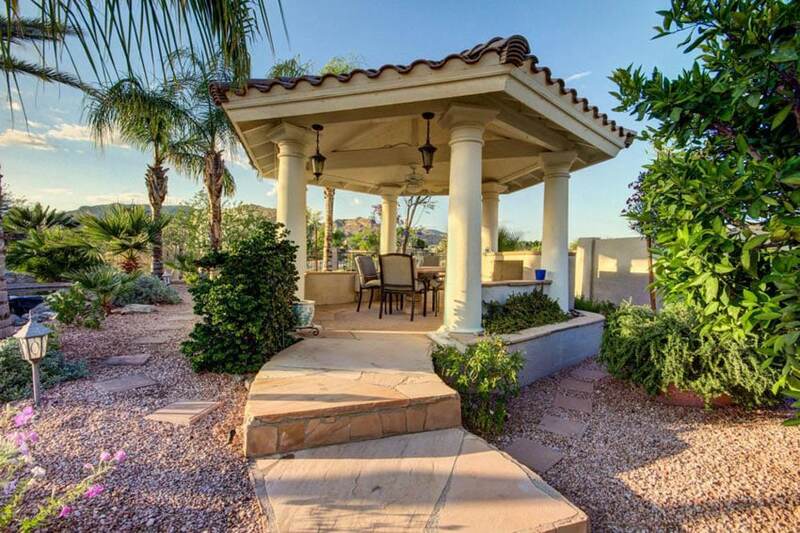 The beautiful Mediterranean style setting features an outdoor patio that is covered by a pillar gazebo. The patio is also the space for an outdoor kitchen. All this is beside a personal pool and various landscape elements in this backyard design. The cedar finish of this 12-foot octagon gazebo sports a varnish that matches that of the elevated outdoor wood deck that it is built into. This corner placement gives users a nice view of the green grass backyard but integrates itself nicely onto the picnic deck. The painted white gazebo matches the pristine and clean feel of this backyard deck. Gray shingles break visual and aesthetic monotony while giving it a classically stylish look. The seating set in the gazebo gives users a place to relax and have a nice outdoor chat. The Neo-classical look of the pillar gazebo in this example is further enhanced by the concave undulating form of the bell roof. This backyard garden has brick pavers and lush greenery that go extremely well with the built up gazebo. 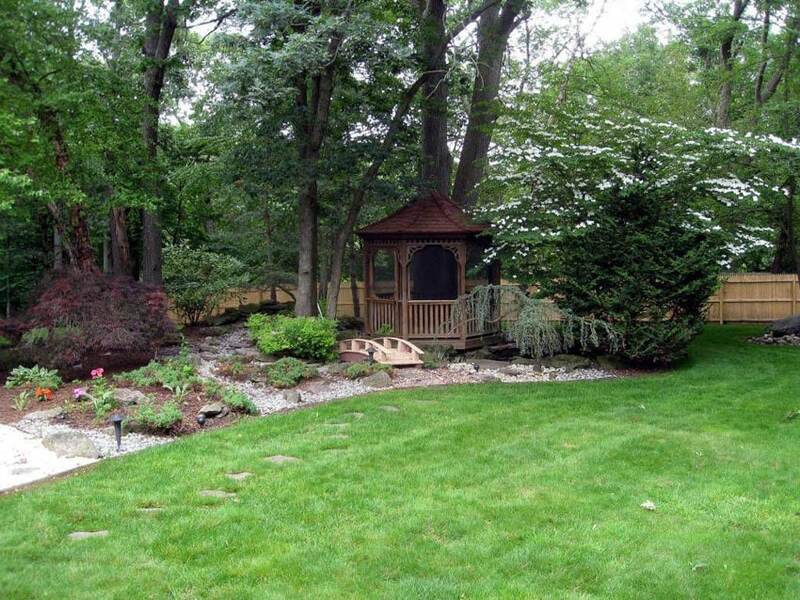 The backyard garden employed an Asian, zen style that is also reflected in its gazebo. The small wooden octagonal structure has a curving roof, wooden pillars, and raw wooden railings typically seen in Asian design. 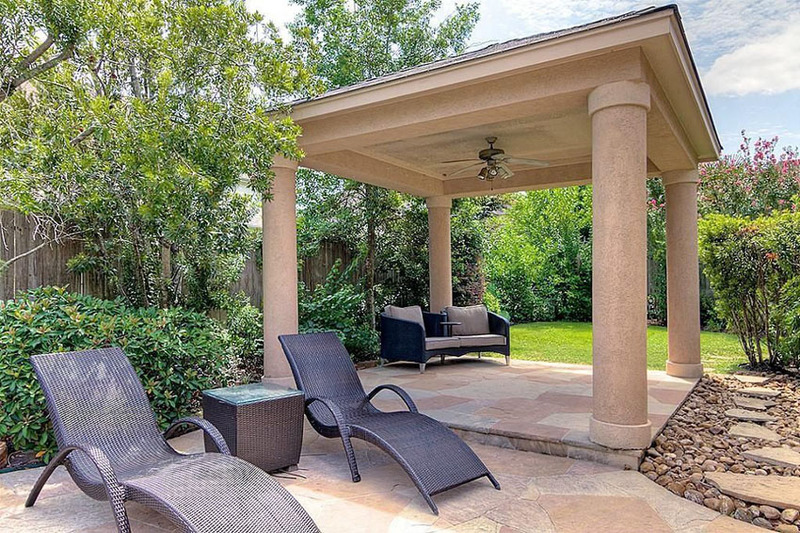 This backyard patio has a stone gazebo that sports a style mid-way between Palladian and Classical. The squat Doric columns that hold up the stone arch capitals have a raw, charmingly boorish quality to them that makes the space feel safe and homey. This backyard utilizes unique outdoor lighting and landscaping designs to make its custom wood gazebo stand out. The gazebo itself sport a stylishly designed back wall with a custom-built window frame and gray wall wood boards. 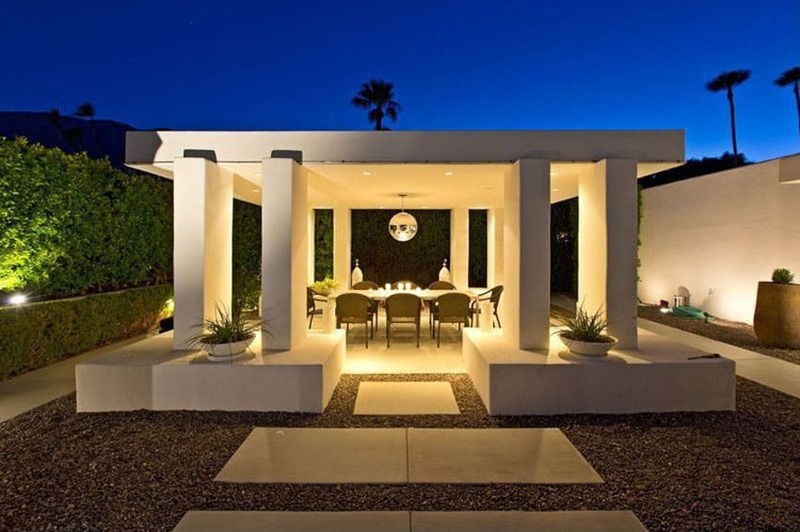 This contemporary and minimalist example of a covered porch gazebo design uses squat proportions, pristine white stone elements, and modernist rectangular and square design elements to achieve a beautiful yet strikingly simple architectural statement. 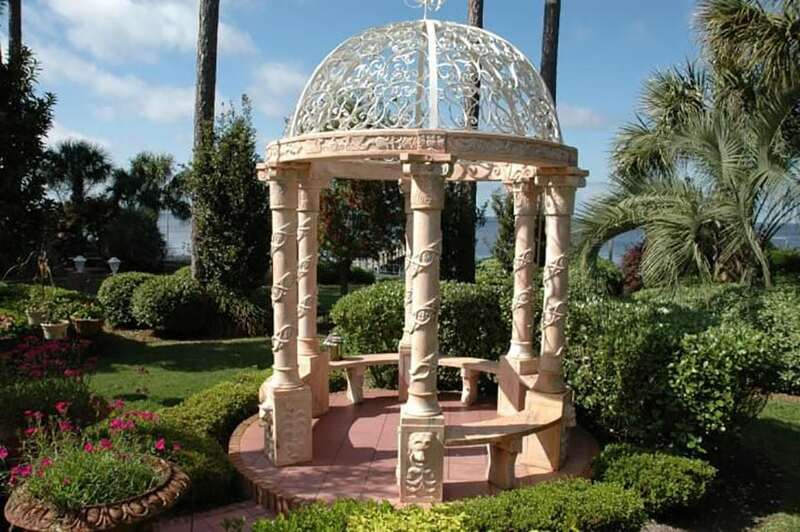 Ornamentation is the name of the game for this custom gazebo. 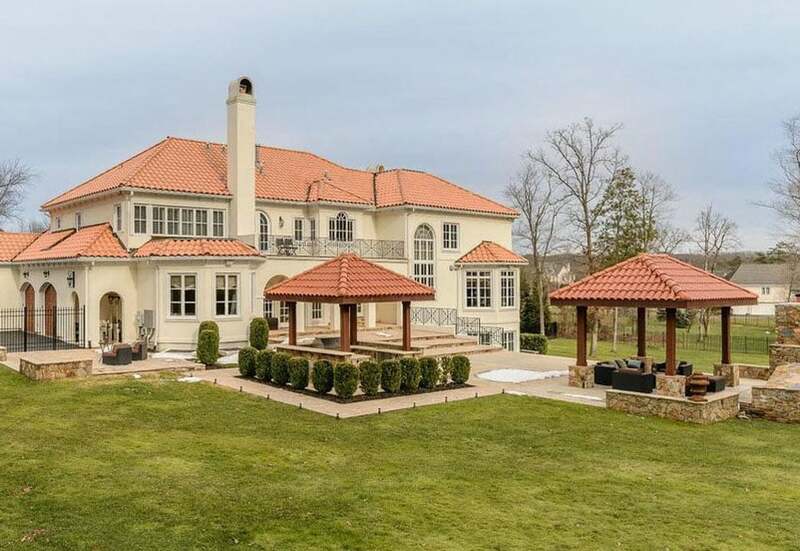 As if to match the beautifully styled landscaped garden and hedges around it, the gazebo sports carved stone columns, a white-painted wrought-iron custom grill-work roof, and built-in stone seating that conform to the circular shape of the structure. Quite similar to the example before except for its heightened sense of sophistication and high-end feel. 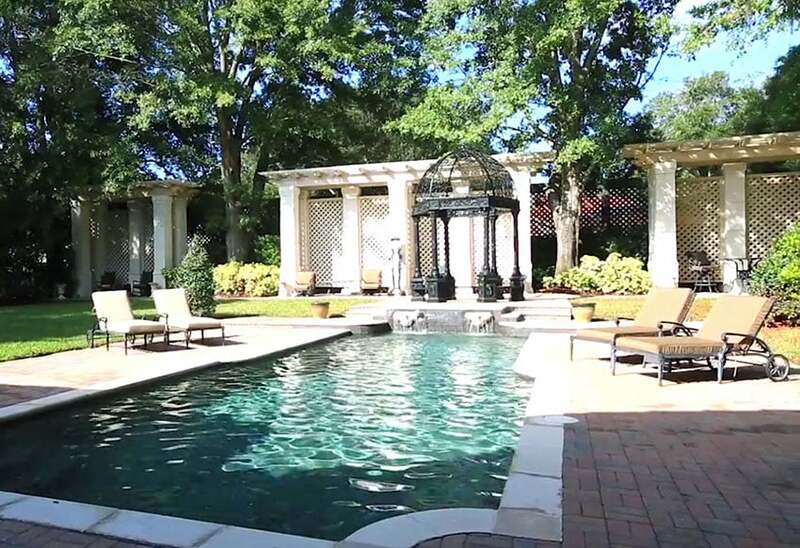 It uses stone pillars, built-in stone benches, and painted wrought-iron intricate pergola. The use of landscaping in this backyard is more subdued yet still beautiful. 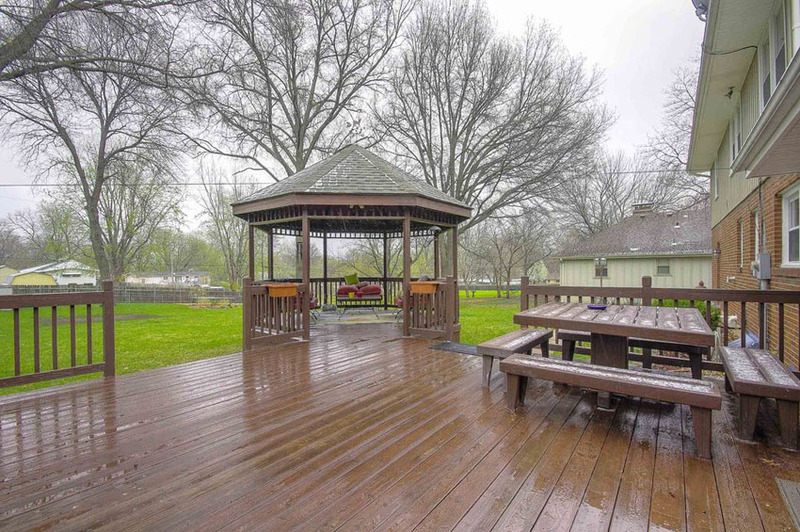 This garden gazebo sports painted pine wood carpentry, beautiful climbing vines, and 10-foot diameter with space enough to have a simple seating set for people to enjoy the garden in. This wood deck doubles as an outdoor spa, with the below-grade personal hot tub located smack dab at the middle of it. At the corner of the elevated deck, we have the wooden gazebo, that has outdoor chairs and serves as a quaint warm space to sit around and soak in the outdoors. 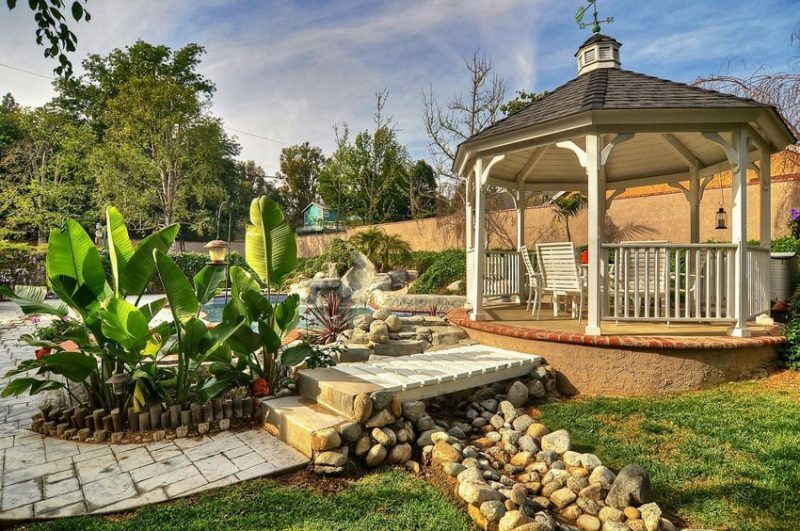 A lakeside layout gives the perfect opportunity to come up with gazebo ideas. Lake-side decks such as this one are prefect place for lounging and relaxing. 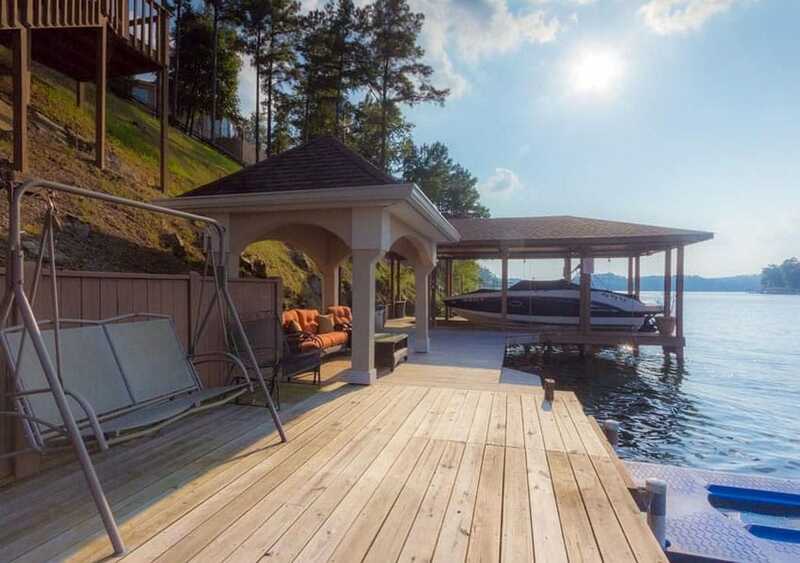 The wood gazebo in this deck is sandwiched between the boat house and a lounge swing. The provided seating gives users a place to unwind and appreciate the view of the lake. 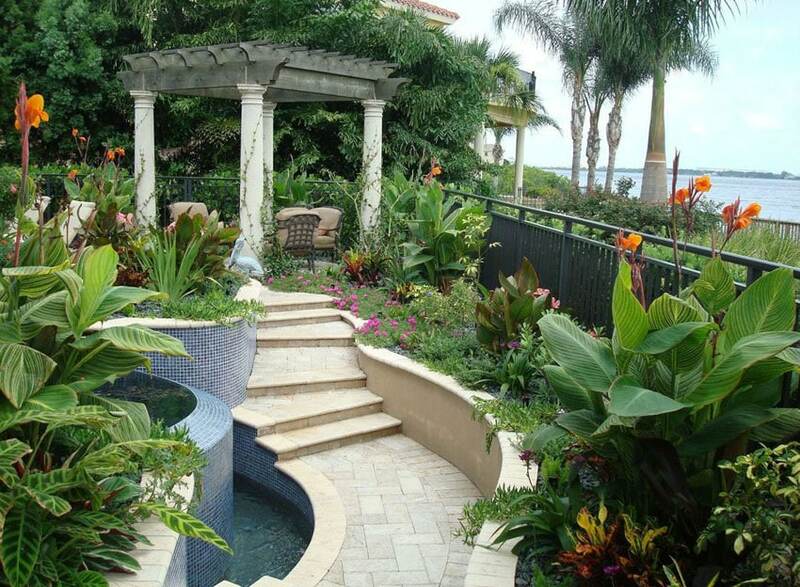 This tropical design employs a generous use of varied landscape flora. The path to the pillar pergola is winding, passes through a water feature and other beautiful landscape elements, and ends with a stairway that leads up to the seating area. 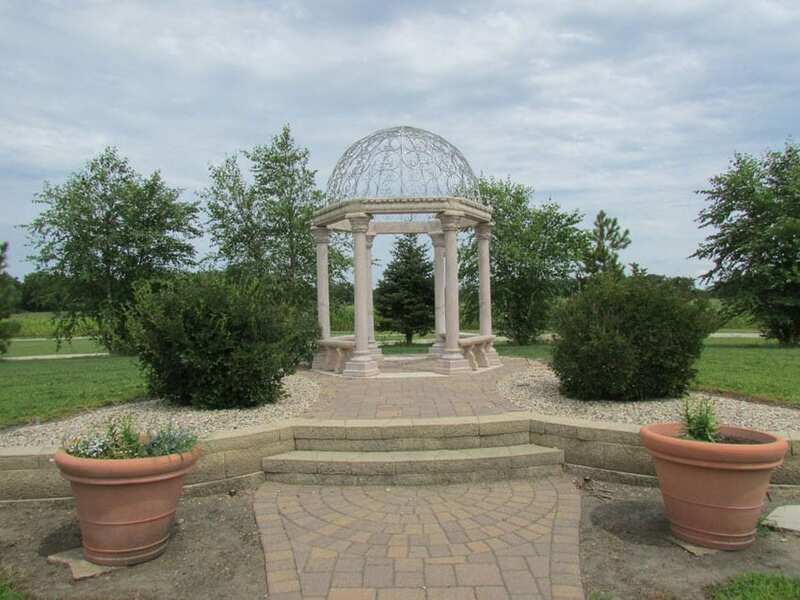 This Tuscan style hexagonal gazebo uses thick stone Doric columns, large squat roof, and a landscaped background that has minimal but stylish use of plants and bushes. Steel gazebos on wood decks are very often movable. Gazebos such as this one are useful for homeowners who prefer flexible and versatile spaces. The steel gazebo used has canopy shades that protect the outdoor furniture from the elements. The four-post open gazebo has a hanging outdoor-grade lighting fixture, white painted square post columns, and royal blue roof shingles. The effect is has on the garden patio really livens up the outdoor area. Gazebo ideas come in a variety of designs. This simple and modern gazebo design employs round stone pillars, an outdoor wicker love seat sofa, slate outdoor flooring, and a motorized ceiling fan-light fixture in the middle of the gazebo ceiling. 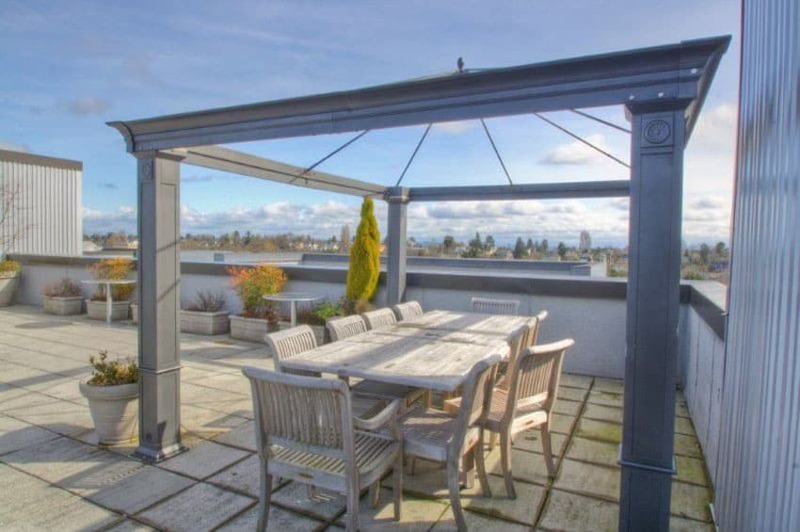 This rooftop patio is perfect for al fresco dining events and meals that one might want to enjoy while enjoying the outdoor sky. The glass ceiling of the contemporary gazebo used is perfect for this; it gives people sitting on the outdoor dining set to be able to clearly see the overhead sky. This stone patio has a quaint brown and white wood gazebo that houses equally charming blue outdoor furniture. The overall feel of the space is cozy and welcoming. 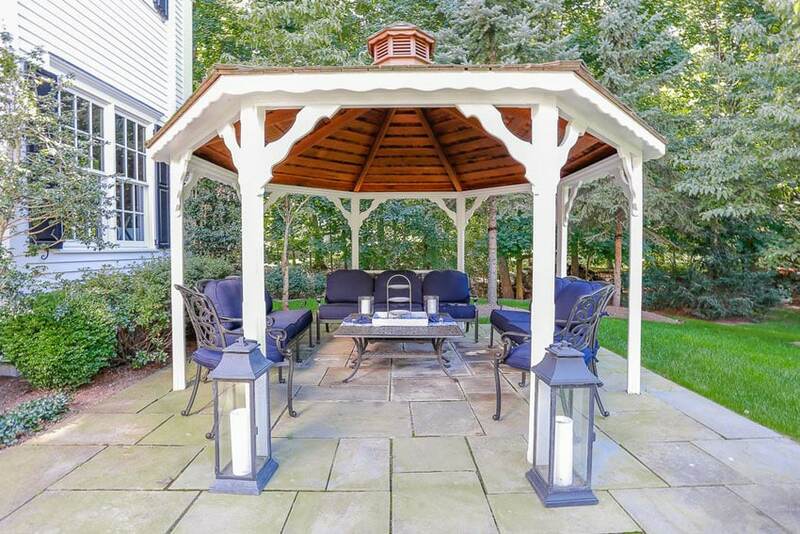 This traditional Victorian design of a gazebo uses white wood, wood shingles, and numerous thin ballusters to create a shaded built-up space that is classy, stylish, and welcoming. Bright and colorful tropical garden backyards make thorough use of landscape elements to enhance the experience of the outdoor space. 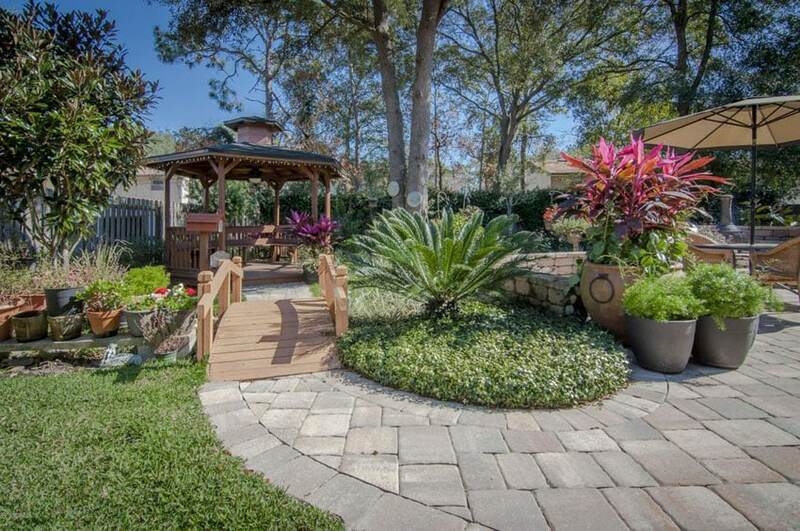 Stone block paths and a small wooden bridge create a path to the beautiful gazebo in the back. Built-in seating, beautiful ferns, and potted plants were used in this space. 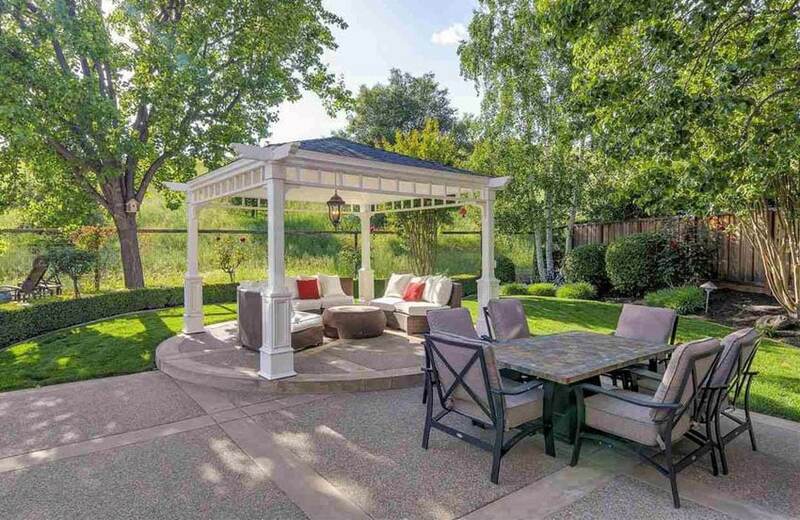 This backyard has three outdoor gazebos that serve different purposes. One houses the personal hot tub while the second one is for a quaint seating space for lounging purpose. The third, main gazebo located at the center is a white pergola gazebo that also houses different seating furniture for relaxation use. The two gazebo structures have simple wooden posts that rest on stacked stone bases. Their main feature is the bright orange clay shingle roofs that parallel the style of the roof seen on the main house. Gazebos and pergolas often times serve as framing focal points for outdoor spaces. 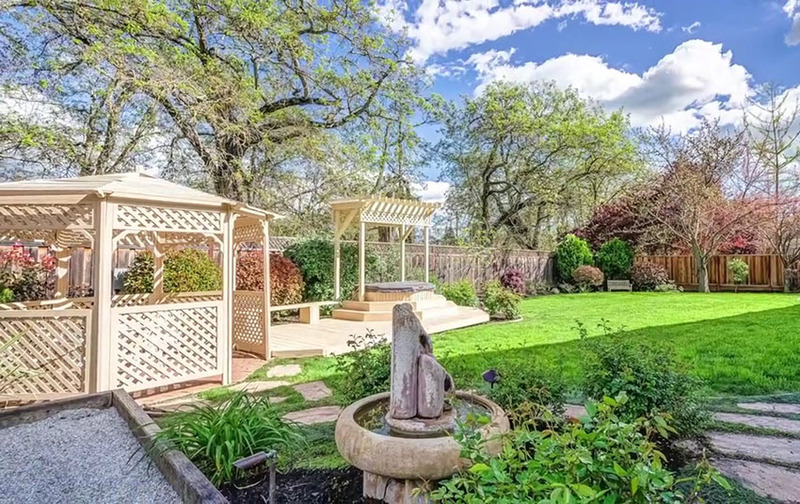 This backyard has a wide grass area, stepping stone paths, and a small water fountain. The used gazebo and pergola are simple wooden ones that both keep the backyard feeling comfortable and very much habitable. 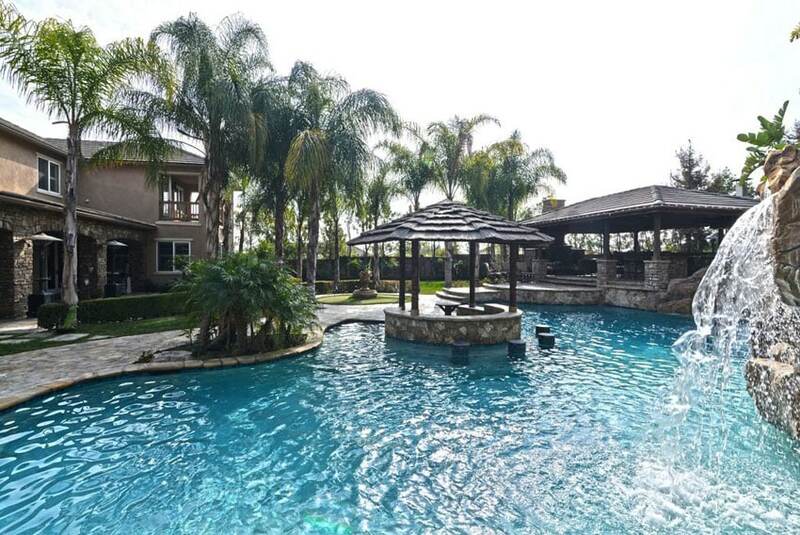 At the more high-end part of the spectrum, the decorative wood octagon gazebo in this design is situated on a landscaped hill and has a very nice view of the swimming pool in this backyard. 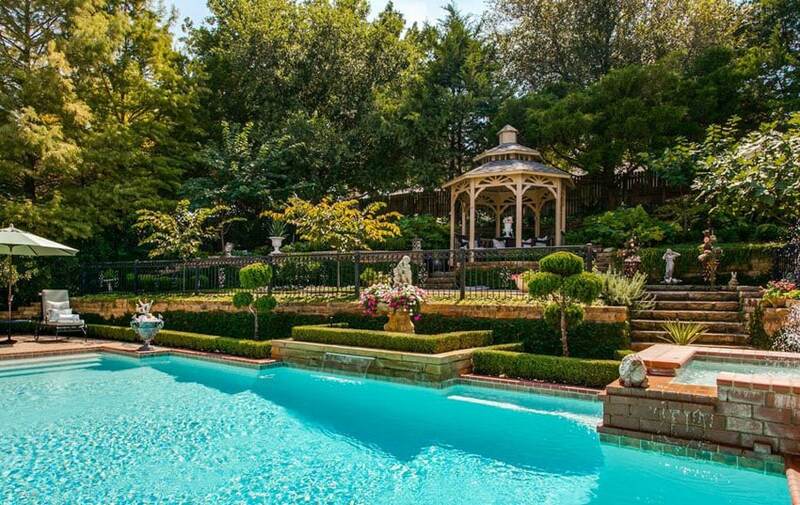 This luxury backyard swimming pool area has a Mediterranean style aesthetic and two Corinthian column gazebos – one houses a quaint outdoor table and seat set and the other is a spa gazebo. The classical Mediterranean style of design can be seen in the arching pillars of the large octagonal gazebo in this space. The luxury swimming pool, royal palm tree landscaping, and lounge seating amenities make this an ideal place for relaxation. 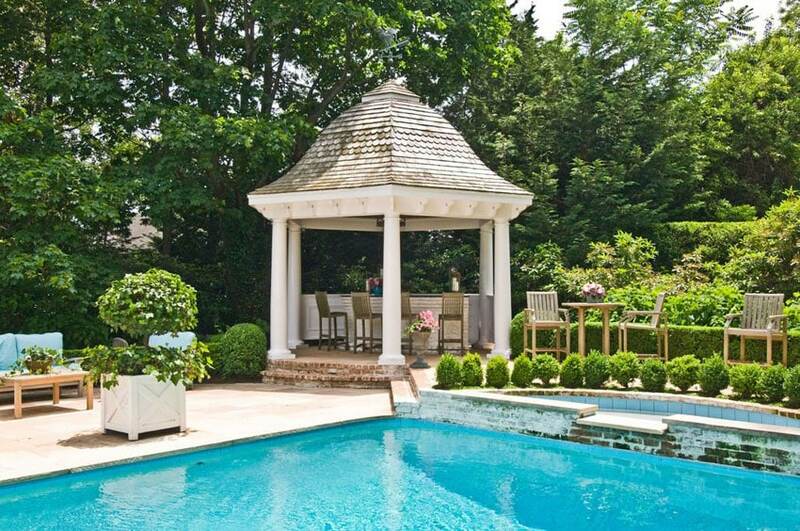 Poolside gazebos such as this one commonly serve dual purposes. Aside from being a shaded area for resting and lounging, it also serves as the entrance to the pool’s service/pump room, presumably. 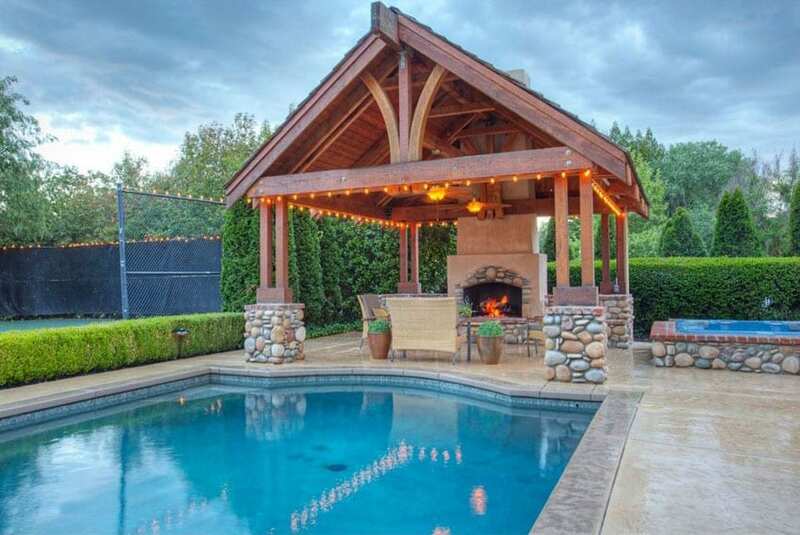 This unique swimming pool-side gazebo has a beautiful gable roof with exposed wooden columns, beams, and rafters. Along with the used of river rock pillar bases, the use of an outdoor fireplace give the space additional warmth and coziness. 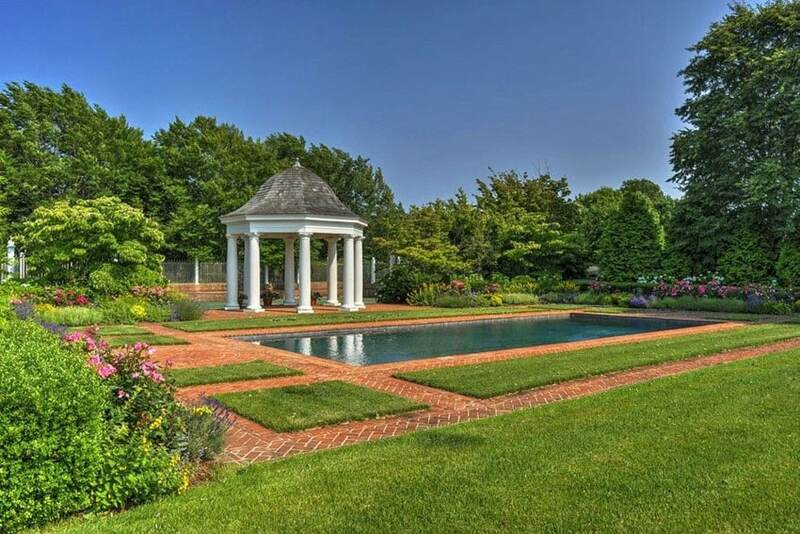 This swimming pool has a poolside gazebo with a bell roof, white sidings, and round white slender pillars. The bar area is located in the gazebo and gives users an elevated and shaded area for drinking and lounging. 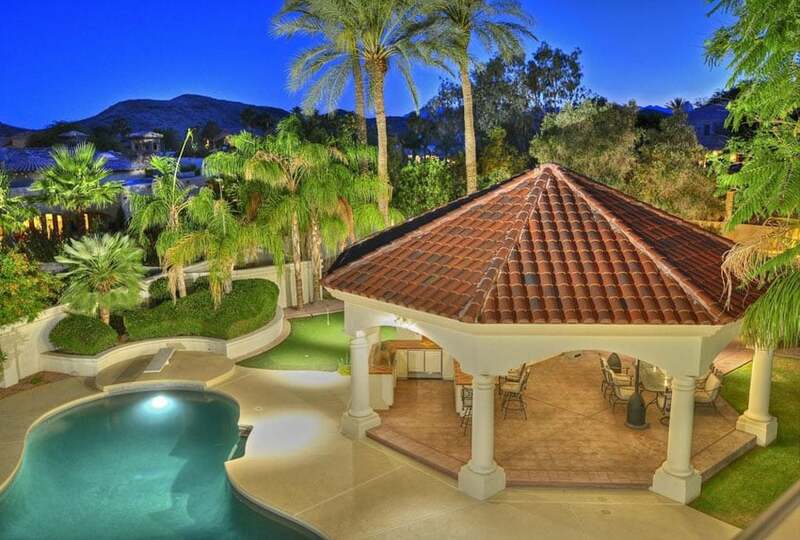 Two beautiful bodies of water surround this lake-front, poolside, Spanish tile-roofed luxury gazebo. It houses the transition space between the two sides of the pool. Its elevated floor gives users fantastic views of the lake as well as the backyard pool. This unique gazebo design is integrated not beside the pool, but inside of it. It houses a pool-level bar and has built-in swim up bar stools in front of it. This tropical garden is a unique example of landscape design – it has winding stone paths that dance around multi-level interconnecting shallow ponds. At the center of it all is a white gazebo, accessible only through a quaint vine arch and small rose garden. 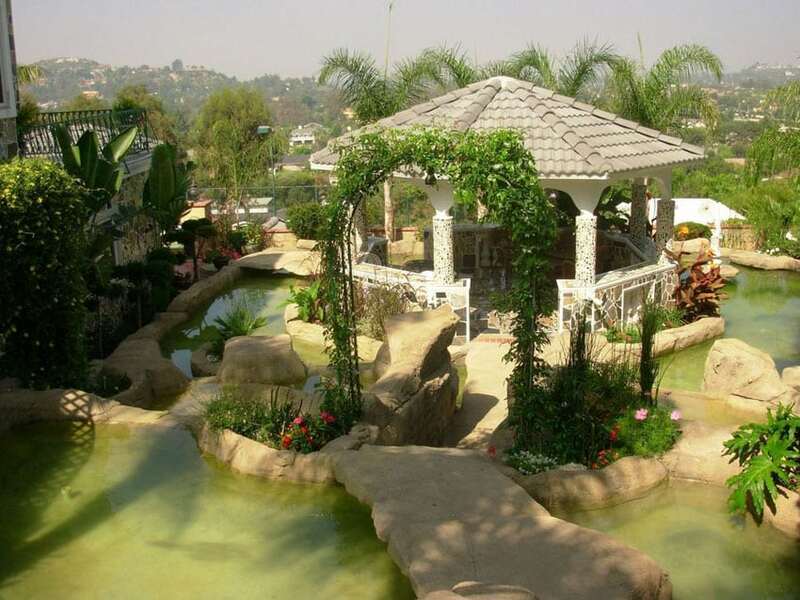 This swimming pool and custom gazebo design combination was executed exquisitely and gracefully. The black wrought-iron look of the gazebo is an amazing contrast to the white stone of the background columns and poolside. 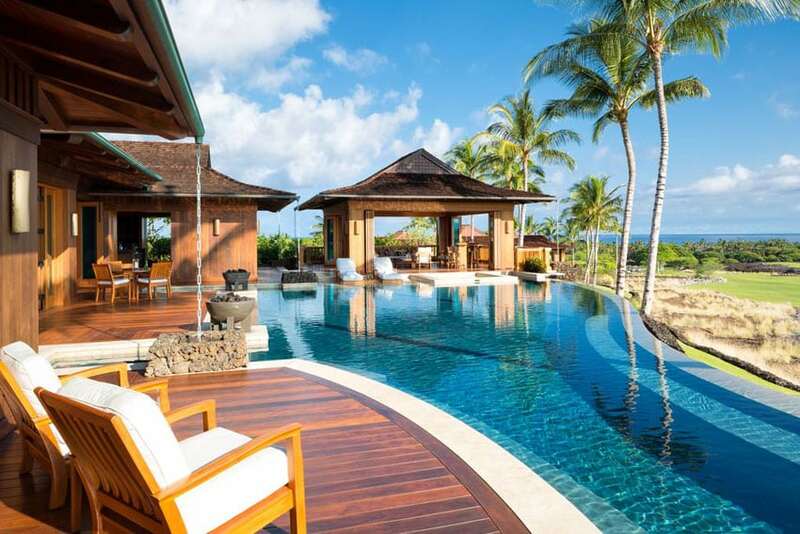 A very open, very tropical example of luxury backyard design, this outdoor space uses a large tropical infinity pool that separates the two poolside wood decks. At the corner of the property, we have the tropical Asian gazebo with its native wooden pillars, steep tropical roof, and lounge seating areas that give the user amazing views of the fields, palm trees, and sea in the distance.